“Nut-Free”? Attempting to restrict peanuts and tree nuts from certain environments has been one approach used by some schools to help deal with these particular allergies. At times these restrictions can be the center of debate. Understanding the issues that come with nut restriction guidelines or policies require a well thought out approach and an understanding of food allergy management in general; here are some points to ponder. PLEASE NOTE THAT PRIOR TO ANY CHANGES IN SCHOOL FOOD ALLERGY MANAGEMENT IT IS ESSENTIAL TO RECEIVE INPUT FROM YOUR SCHOOL NURSE OR DESIGNEE, AND/OR ADMINISTRATION. Background: Nuts and Bolts :”Nut-free”? Food Allergies are a growing national concern. More kids these days have them. Food allergic reactions can be life threatening and unfortunately students have died in school from their allergic reactions. People can be allergic to practically any food, but 90% of the foods that they are allergic to fall under the 8 most common allergens: peanut, tree nuts, milk, egg, soy, wheat, fish and shellfish. Although rare, deaths occur. When looking at characteristics that seem associated to higher risk of death the most important is a delay or lack of administration of epinephrine. Other risk factors are being allergic to peanut or tree nuts, being a young adult or adolescent, and having asthma. Restricting peanuts and tree nuts from certain environments has been one approach used by some schools to help deal with these particular allergies. Banerjee and colleagues found that a peanut-free guideline in their participating schools decreased (but did not, 100% prevent) peanut brought into the classrooms . At times these restrictions can be the center of debate. Understanding the issue of nut restriction policies requires a well thought out approach and an understanding of food allergy management in general; here are some points to ponder. Effective Food Allergy Management is Critical “Nut-free”? 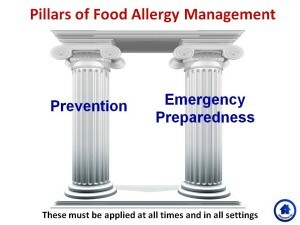 Ultimately, avoidance strategies and emergency preparedness, the two pillars of effective food allergy management, must be carried out at all times and in all circumstances. This goes for any allergen, from milk to nuts. Label reading, avoiding outside food, no sharing, effective cleaning strategies, good hand cleaning, excellent communication, etc. must be put in place. Staff must be trained to recognize allergic reactions and anaphylaxis, know their role in their schools emergency protocols, and epinephrine must be efficiently given. Effective policies and procedures should be established that go well beyond simply sending out a notice that a room or building is “nut-free”. Effective policies take the students’ developmental capabilities into account in addition to school resources and physical space. Some schools may find that in addition to implementing excellent food allergy management strategies, they choose to attempt to restrict particular allergens. In these cases, this additional restriction will not compromise safety and may serve to decrease the amount of allergen brought into that particular environment. The Voluntary Guidelines for Managing Food Allergies in Schools and Early Care and Education Programs (CDC Food Allergy Guidelines), as well as state guidelines and other guidance documents serve as excellent resources to guide implementation of food allergy management in our schools. When considering whether or not to implement certain specific allergen restrictions it is necessary to consider the developmental level/age of the students. Young children explore their environment with their hands and mouths. Tulve and colleagues demonstrated that the average number of times a child between the age of 12 and 24 months put their hands or an object in their mouth was 80 times per hour. For participant between 2 years old and 5 years old, the average was 40 times an hour. Older children start taking on their own management strategies and by high school they are almost completely self-managing and can wash their hands before they eat, or put their hands in their mouth, eyes or nose. Knowing the potential routes of allergen exposure, as well as challenges and effective strategies to preventing these exposures will be necessary for all school personnel that interact with students of any age. It is also necessary to consider the resources of the school when considering whether or not to implement certain specific allergen restrictions . If students are eating in the room that they learn and play in then this will have different implications than if the students have a separate space, like a cafeteria where food is prepared, served, or eaten. Other than physical space additional school resources must be considered: soap and water availability, hand wipes, number of staff supervising meal/snack time, number of staff cleaning before and after any eating, designated time for hand cleaning strategies, etc. Age Appropriate Participation in Food Allergy Management : “Nut-free”? It is important for children to have age appropriate participation in their own food allergy management to help prepare them for the real world. It gives them the opportunity to develop mastery and to practice while still under the supervision of knowledgeable adults. When they are older and more independent they can start taking responsibility for certain aspects of management. Ultimately, our goal is to have children confidently and safely implement all prevention and emergency preparedness strategies when they are no longer in an adult’s care. If a school has policies and procedures that continue to encourage necessary management strategies (label reading, avoidance of cross contact, hand washing, etc.) then additional allergen restriction won’t send our children the wrong message. On the other hand, if students are told “don’t worry, it’s ‘nut-free,’” these and other examples of lowering vigilance can have undesirable effects on self-efficacy and safety. School Community Food Allergy Awareness and Education : “Nut-free”? All members of the school community (students, parents and staff) will need to be adequately informed about school food allergy related policies, including those addressing a specific allergen restriction. Additionally, all members of the school community will need to have food allergy education and awareness tailored to their role in school. The challenges is that relying on the skills of others (like class-room parents) to avoid exposure to allergen can open the possibility of a mistake. No matter the restriction policy, all staff will need to participate in food allergy management education and training, consistent with CDC, state, or local guidelines, and will need to know their roll in their schools’ policies and procedures. All parents will need basic food allergy awareness, will need to know the food restriction guidelines or policies and will need to have clear and explicit instructions regarding the food that they send in for their own children. Students will also need basic food allergy awareness and understanding that can help prevent food allergy related bullying and help support their peers. Outside food without a label is a common cause of allergic reactions as there are risks of hidden ingredients and cross contact with allergens .Even when an allergen is restricted from a school people need to be reminded to continue all other necessary prevention strategies as well. Restrictions of certain allergens (“bans”), have at times been in the center of divided school communities. Adequately educating the entire community can help bring an awareness and an understanding of why certain policies or guidelines have been chosen. Once awareness and understanding are established, members of the community can help create a supportive and safe environment for children with food allergies. Practical questions that will need to be addressed by the school if allergen restriction is used: “Nut-free”? Are we calling this ‘free’ or ‘aware’? Nothing is a guarantee. Even the most vigilant make mistakes. Regardless of the allergen restriction chosen for the school community all other food allergy management strategies will need to be implemented. Continuing to allow the community to know this will be important. Many schools that choose to implement restrictions are using the term aware instead of free or safe. Where will we restrict the allergen? Clearly defining where allergen restriction will be used is important. Will it include the entire school, classrooms, specific classrooms based on developmental capabilities, or be limited to designated tables etc? What are we calling a nut? Schools will need to clearly define what allergen they are restricting and to what extent. Although many people consider nuts both peanuts and tree nuts, schools will need to make it clear what allergen or allergens they are restricting. Also it is very helpful if the school provides resources to educate parents and staff on how to read labels for allergens. What do we do about advisory statements? Another aspect of the restriction that will need to be clearly defined is what to do about advisory statements/cautionary labels? Studies show that when these statements are present, there is a chance that allergens may be present. In most cases healthcare providers suggest that people who are allergic to that particular allergen avoid eating products with advisory labels for their allergen. If students do not share food and children are not eating foods not meant for them, then the argument can be made that allowing cautionary statements is reasonable. This restriction can help decrease allergen that could result in cross-contact exposures although eating the food itself must be prevented. Special thanks to Anne F. Russell, BSN, RN, AE-C and Anne H. Sheetz, RN, MPH, NEA-BCfor their thoughtful reviews of this post. Food Allergy Education Table: A reference table that highlights teaching points tailored for specific groups – elementary school students, adolescents, families with and without food allergies, and school staff. Links are provided to relevant educational materials. Food Allergen Exposure in School Setting: A reference table that reviews evidence, challenges, and interventions for exposure to food allergens in school. Schools.AllergyHome.org: Free resources for school community food allergy and anaphylaxis education consistent with the CDC guidelines. Video modules and other resources are tailored to different groups within the school community. Anaphylaxis, A How-To Readiness Guide for Schools (National PTA): Food allergy and anaphylaxis awareness tools designed for PTAs/PTOs to educate all parents in the school community. Banerjee DK, Kagan RS, Turnbull E, Joseph L, St Pierre Y, Dufresne C, Gray-Donald K, Clarke AE. Peanut-free guidelines reduce school lunch peanut contents. Arch Dis Child. 2007 Nov;92(11):980-2. Epub 2007 Jun 7. Tulve, N. et al. “Frequency of Mouthing Behavior in Young Children.” Journal of Exposure Analysis and Environmental Epidemiology 12 (2002): 259–264. Young M, Muñoz-Furlong A, Sicherer SH. Management of food allergies in schools: a perspective for allergists. J Allergy Clin Immunol. 2009 Aug;124(2):175-82. We’d love to know. Please comment. Does your school restrict specific allergens? Which ones? What is done with the advisory statements? Where are the restrictions? What grade levels are your students? What do you call these restrictions?